On the one hand the philosophy of being, on the other the culture of appearing; on the one hand simplicity and naturalness, on the other fictions and prejudices. Is this the real life or is it just an invention of progress? The protagonists of this esoteric novel with noir aspects, two young guys in their thirties, live in contempt for the artificial civilisation that corrupts the natural world, altering the ecological and personal balance. They try, then, to save themselves by experiencing, in an absolute, all-encompassing way, the real meaning of Nature. And they live on dreams, magical, splendid or mysterious: they need to know that one can still be brave. But Nature can also change, observe and judge, turning those dreams into a nightmare. A metaphor for the nature of every person: a complex and unpredictable nature. 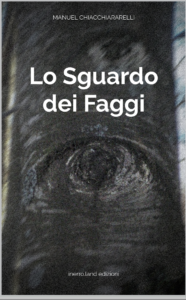 “A really disturbing psychological mystery, this by Manuel Chiacchiararelli. Great suspense, with interesting implications under at least two profiles, the sociological and the spiritual-mystery, connected to each other. The translation of the novel and the release of english version is part of my future projects.